On the 20th April a new character appeared in the Altadorian Archives, the Lenny Conundrum Lenny! You should go and visit him. A familiar-looking Lenny beckons you over to the side of the lobby. Hey! It's that Lenny from the Lenny Conundrum! "Hey, you! Listen, you know Finneus, the archivist, right? I heard him say you've been helping him with some kind of... history puzzle, or something. I don't know, but anyway. Finneus is my uncle, and I want to give him a special surprise for his birthday, which is coming up soon. It's the fourteenth day after the square root of the number of Grundos you find in the--er, sorry, nevermind. Force of habit. Anyway, look, here's what I want to do: He's got this favourite Meepit plushie of his, yeah? And I want to decorate it all nice for his birthday." He grumps. "But I want it to be a surprise! He's always in that office of his, so I can't get ahold of it. If I hang around until he turns his back, he'll get suspicious. But since you're always in there, you could get it without him noticing. So, can you help me?" You should now go back to the Archivists Office. Click on the vase in the corner. You throw a pebble at the vase. The archivist spins around at the sound of something plinking against the vase. "What? What's was that? Did you hear something?" You should now click the Meepit Plushie! The archivist shrugs and turns back around. "Oh well. I'm just hearing things as I get old, I suppose. Say, I wonder where I put that Meepit plushie..."
Taking this back to the Lenny Conundrum Lenny, you soon discover that it is NOT the one you wanted! "Great, you got the plushie! I--" He looks at it, startled. "Wait a second, this isn't his favourite Meepit plushie. That one has, uh, um... well..." He scratches his head. "It's a little different, it's got a... a thingy... Look, I'll know it when I see it. You've got to go and get his favourite plushie. Hurry! His birthday is only 94 times the number of bolts on the Virtupets Space Station seconds away!" Return to the Archivists Office now. The archivist smiles as you enter. "Well, I had to dip into my stash of extra Meepit plushies to replace the one I lost. Good thing I buy them in bulk!" Return to the main Lobby of the Archives, and click the door handle to the other door. This will take you into the depths of the archive. 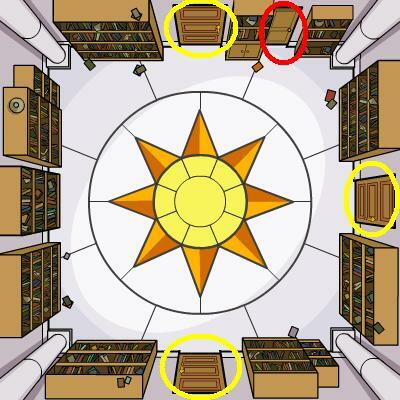 Move from room to room by clicking on the main doors highlighted in yellow below. Every room you move into, try clicking the smaller door that is highlighted in red. Most rooms you will not be able to open that door, but in one you will. How interesting... a box of Meepit plushies. This must be where the Archivist keeps getting his replacements! Click on the 'Hide the Box' button. You hide the box of Meepit plushies in another closet. Now the Archivist will never find them! Now return to the Archivist and click on the vase again. The archivist frowns as you enter. "Hm, I seem to have misplaced my box of replacement Meepit plushies. I only have one other one... my favourite." He pulls a battered old Meepit plushie from a locked cabinet, and sniffles as he examines it. "This little guy was the first Meepit plushie I ever bought!" The archivist shrugs and turns back around. "Oh well. I'm just hearing things as I get old, I suppose. Oh no! My favorite Meepit plushie is gone!" He sobs, dismayed. "Excellent!" he cheers as you bring him Finneus's favourite Meepit plushie. "This is the real one. Now, let me just put this ribbon on it--" RRRRIP! "Uh oh." "Oh no! I tore the Meepit's head off! Woe!" He looks down at the headless Meepit plushie. "I--hey, what's this?" He reaches into the plushie and pulls out an old, dull, rusted dagger that was hidden inside the plushie. "Huh, some kind of dagger stored inside the plushie. How weird. Oh well. I guess you better give this plushie back to Finneus. I hope he's not mad at me!" Click on the knife handle that is sticking out of the plushie. The archivist sniffles as you enter. "Oh, my poor Meepit plushie! My absolute favorite! But at least my nephew meant well when he destroyed it by accident. And of course, it led to finding a clue! How fortuitous! Well, you best be off to the observatory while I mourn my poor Meepit plushie." The janitor hurls a book of Lenny Conundrums to the floor and shouts, "RARRRGHH!! THESE CONUNDRUMS ARE TOO HARD!! I'LL CRUSH THAT LENNY IF I SEE HIM!!" The Astronomy Club members greet you warmly as you enter the room... except the club president, who grabs a protractor and threatens you with it every time you come near him. The other club members give you overly casual nods. The Wocky sidles up and whispers, "Don't worry, we'll be making our move soon. In the meantime, hang onto this. And don't ask where I got it." The Wocky explains, "Let's just say it might come in handy later on. Or it might not." She winks and wanders away. Please note: This is a real item and can be stolen by the Pant Devil. Please make sure you keep it safe. You CAN equip it to your pet, if not please keep it in your Gallery or SDB. The archivist says, "Naturally, Kelland, the Thief, would have his constellation found on a dagger. Indeed." He lets out a sigh. "This would seem to remove Kelland from the list of suspects. It would have made the most sense, 'twere it him, but alas. I still cannot accept that Fauna, Jerdana, or even Altador himself could be responsible for this!" He blinks. "Unless... wait a moment... something is stirring in my memory..." He glances up at the ceiling for a moment, as if peering into the distance. "Ah HA!" he shouts. "Yes, I think I know where to look. This search may bear no fruit, but I must try. I will have to go into the archives for a while. But continue your search; there are only three constellations left to find, and we may not have much time left." The Gems above the Kelland statue now glow!